Today it was very hot here in Shirahama. There were some people on the beach but there were not many surfers. Because they didn’t have a good wave today. However, I want to swim too!! 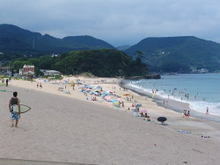 This entry was posted in beach on 2008年7月16日 by izusakuraya. I hope to stay with you at Sakuraya soon ! We also are looking forward to meeting you someday.